*Find an abridged version of this review on DiaboliqueMagazine.com! For a film with 10 directors, 10 writers, and five unique segments, you’d think V/H/S would be able to do something innovative. 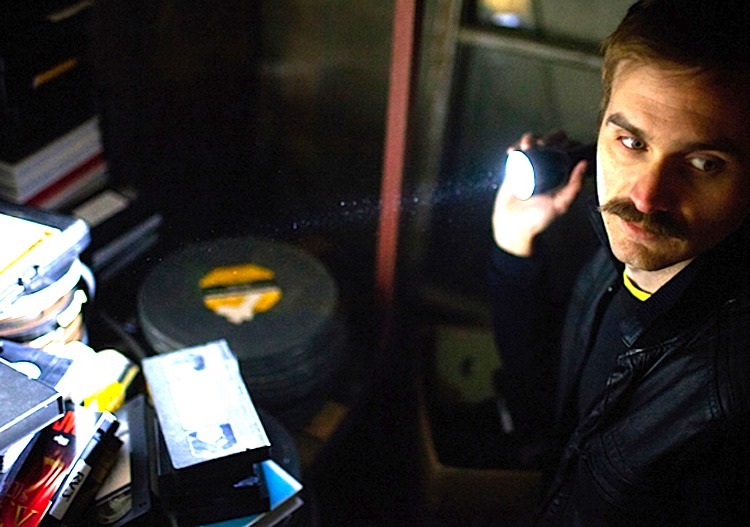 Unfortunately, for all its moving parts it’s just a giant mishmash of genre cliches and jiggly, low-fi camerawork. Its few transcendent moments don’t even come close to making up for the rest of it; the whole, in this case, is dramatically less than the sum of its parts. I saw this film at a press screening in a trendy Williamsburg gastropub-theater, where appropriately hipster-attired representatives from Magnet Releasing were on hand to talk up the film and distribute free drinks. This strategy may have backfired; after imbibing quite a few cocktails before finally settling in for the film, the audience’s prevailing mood was rowdy and full of giggles. This didn’t do the film any favors, since the gotcha moments were met with more peals of laughter than they might have received had we all been sober. On the other hand, perhaps my not being able to recall the film in precise detail—full disclosure: I enjoyed three delicious “corpse reviver” cocktails beforehand—is actually a good thing. The film’s background story into which the five vignettes are inserted follows a group of stupid young men always on the lookout for easy money, and vulnerable women whose tops they can yank down on camera for fun. Are we supposed to hate these characters, or find them vaguely amusing? It’s unclear. The film certainly leans toward the latter, but I, for one, was instantly turned off by this suggestion that sexual assault can be, you know, not a big deal and sort of funny. If the directors were seeking an easy way to get their audience interested in the story and the main characters, they definitely failed on that count. At any rate, the group of losers soon catches wind of an abandoned house that contains a massive VHS collection, a dead guy (or is he?!) in a chair, and a single tape that someone, somewhere, is willing to pay them serious money to retrieve. The rest of the film is set up as them watching various tapes they find in the house to try and find the one they’re looking for. The first vignette tries hard to dispel the misogynist tinge already firmly in place by having a demonic female character wreak bloody revenge on a group of almost-rapists (problem solved, right?!). The rest of the pieces feature a faltering married couple trying to rekindle their connection while being stalked by a murderous first-person cameraman, a group of friends chasing a demon in the woods, a mentally ill girl being gaslighted by her boyfriend via Skype, and yet another group of young frat boy types who head to a halloween house party only to interrupt something that looks like a lost outtake from ROSEMARY’S BABY. Again, in this final segment, a ham-handed attempt is made to counter the sleaziness of the film’s reliance on naked ladies, voyeurism, and general boy’s-club mentality by having the characters rescue a damsel in distress. I honestly don’t remember the ending terribly well, because by then I had already half gotten up to walk out three times, and was drowsy from the free cocktails and absurdly overlong running time (the film clocks in at a self-indulgent 116 minutes). 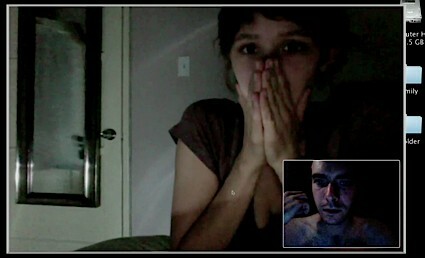 Everybody dies, of course, but I don’t think I was alone by that point in totally not caring. Here’s the problem with this film: the writers and directors (who are mostly, but not entirely, the same group of people) are all 30-something men who have achieved enough success in the world of low-budget mumblecore films that they seem to feel they no longer have to try. There are some truly talented people in this group, chief among them Ti West, whose 2009 The House of the Devil was a study in how to effectively reappropriate the classic genre markers of 70s/80s horror cycles for a modern audience. His follow-up (politely overlooking his Cabin Fever 2: Spring Fever) was 2011’s The Innkeepers, a film that started nearly as promisingly as House but that ultimately crashed and burned with an unforgivably botched ending. Unfortunately, West’s increasing reliance on gimmicks and mindless clichés over actual suspense and character development seems representative of this group of up-and-coming filmmakers in general. Nowhere in V/H/S is the same level of attention given to any character as it is to the star (Jocelin Donahue) of West’s House even in that film’s first ten minutes. Well, you might argue, how could there be? The film is an anthology, not a straight, single narrative. My point exactly: the filmmakers have chosen to make a choppy, half-assed film that tries to cover its shortcomings by stuffing itself full of different bodies and different gimmicks every twenty minutes, rather than actually collaborating on a story that is well-thought-out and sustained enough to display any of the group’s talent. Pointing out V/H/S’s shortcomings will surely get me labeled a malcontent, an angry feminist (guilty), or just someone who just doesn’t understand how AWESOME it truly is. These filmmakers certainly have a devoted coterie of like-minded and similarly-aged fans, mostly male, who seem to enjoy their work more for its in-jokes and clubby informality than its actual craftsmanship (did I mention the entire thing is shot, nauseatingly, in what looks like hand-held mini DV?). But giving kudos to this film (as many are also doing to P.T. Anderson’s The Master, I believe for the same reasons) purely because of who’s involved in it and in spite of how bad it actually is is not only dishonest from a critical perspective, but just bad form for the serious horror aficionado. 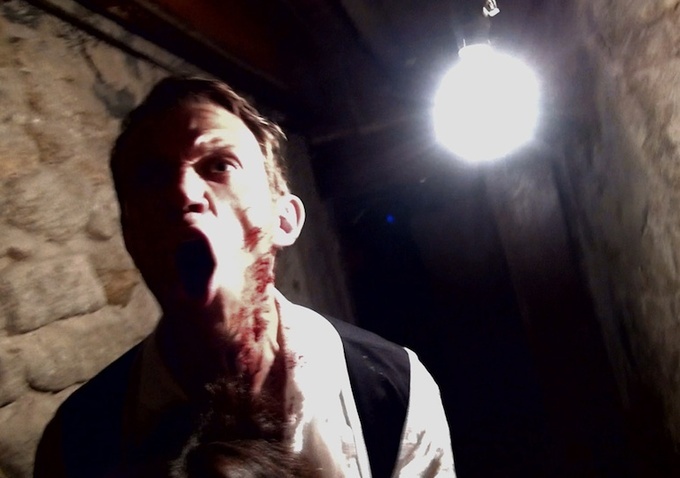 I sincerely hope V/H/S isn’t a harbinger of where the horror genre at large is headed. Even with free cocktails, I’m not sure I’ll be able to take it. 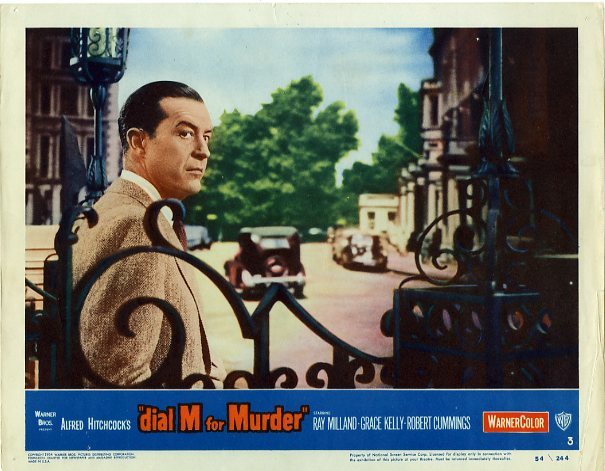 I had never seen Hitchcock’s Dial M for Murder (1954) before, but I knew its reputation as one of his lesser works. Dial M is widely reputed to be too close to its theatrical source material to be considered a cinematic masterpiece—people complain that it’s too stagey, and just feels like theatre on film (a complaint also frequently leveled at another overlooked Hitchcock film, Rope ). In stark contrast, Hitchcock’s other 1954 effort, Rear Window, is widely viewed as one of his best. It’s an institution in film studies: if you ever take a class in film theory at the university level, the first film you will watch will likely be Rear Window. 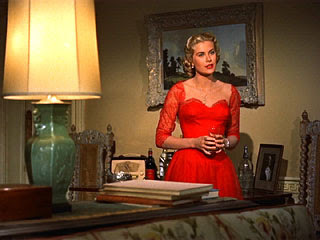 The two films even share a star, the luminous Grace Kelly, who also went on to act for Hitchcock in To Catch a Thief (1955). However, seeing Dial M in 3D, as it was originally intended, makes me wonder whether the fact that it was mostly projected in 2D upon its release negatively—and unfairly—affected its reputation forever afterwards. As film theorist and historian David Bordwell details in an exhaustive blog entry on the 3D re-realease of Dial M, 3D was an already fading fad by the time the film was released theatrically, and the lack of standardization when it came to 3D exhibition technologies meant that many (if not most) theaters opted to just screen the film in 2D and save themselves the trouble. I could easily imagine, while watching the 3D version, that looking at the rather confining space in which the story unfolds for an hour and forty-five minutes could get pretty boring. 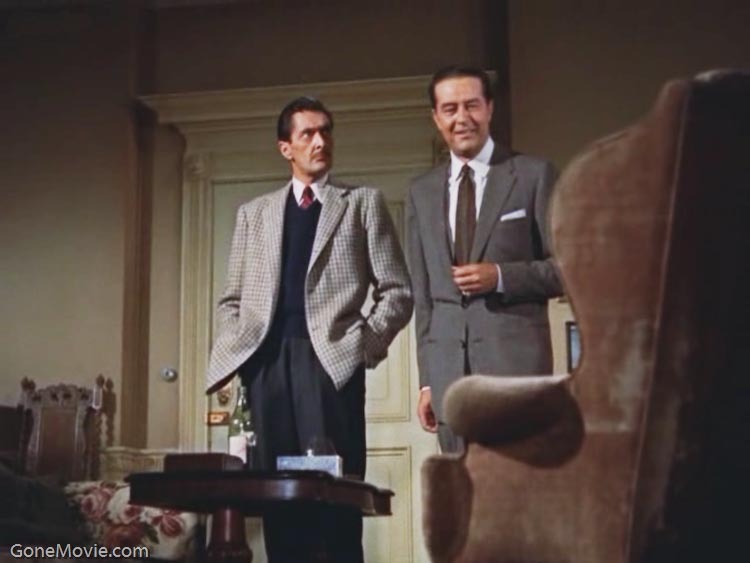 As a Hitchcock world, the physical environment of Dial M is pretty uninspired; a good 80% of the film happens in two rooms of a wealthy couple’s London apartment, the couple being Ray Milland (The Lost Weekend) and Kelly. The story revolves around Milland’s plot to have an acquaintance (Anthony Dawson) murder his wife, and the ensuing complications. However, though it certainly doesn’t display the stunning visual acumen of films like North by Northwest (1959) and Vertigo (1958), there is something complex at work in Dial M, a surprisingly understated yet concentrated mixture of composition and camerawork that not only animates the story but creates an enormous amount of tension and surprise within a very restricted onscreen world. 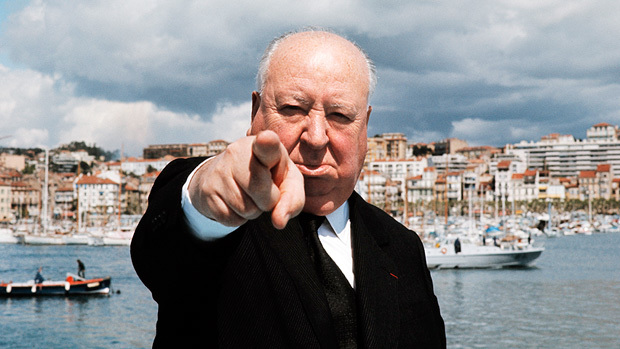 Often, Hitchcock composes shots in Dial M expressly with his camera focused on something far back in the frame, thus emphasizing out-of-focus images of the mise-en-scene up close to the audience (what J. Hoberman refers to in his Village Voice review as, “a clutter of monumental bric-a-brac”). This repeated use of out-of-focus props serves to draw the audience into the frame and remind us that we’re involved in a three-dimensional world, not just the flattened milieu of cinema. Oddly, though, the few exterior shots, most of which involve characters in or getting in/out of cars, are composed very obviously using mattes and studio-shot footage. It was difficult to miss; the 3D effect amplified the jiggly edges of the matte and the cut-out film, and the discrepancies in lighting between the matte footage and the studio footage were glaring at times. This—for me at least—created an opposite effect to that I experienced during the interior scenes; the matting served to flatten the exterior sequences and collapse the depth of the world outside of the apartment. 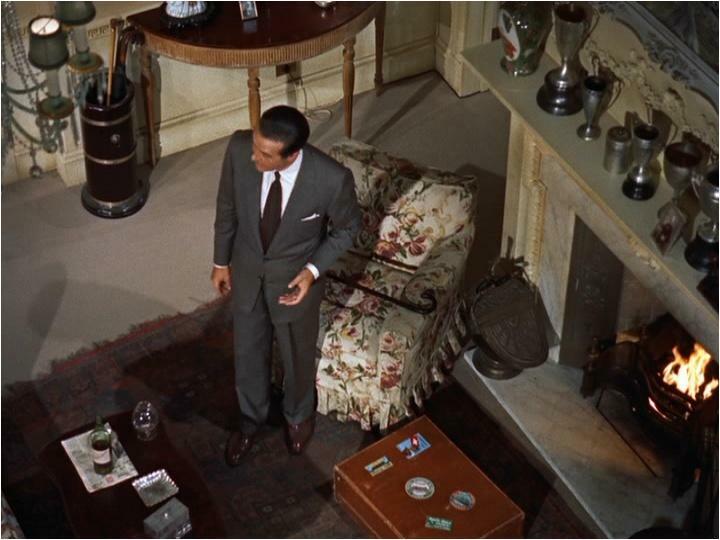 In short, using 3D and careful depth-of-field composition, Hitchcock was able to make the world inside the apartment seem more real, more immediate, and more tangible than anything outside. The use of mattes and back projection in the film’s exterior shots is glaringly obvious. 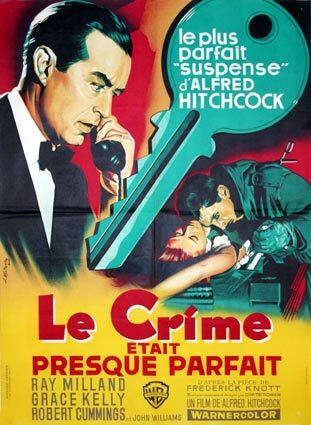 To this end, there are only two moments in the film when the 3D effect is used for its own sake: first, when Grace Kelly extends her hand toward the viewer as she’s being attacked (it’s the image on the poster), and second, when another hand reaches out to the audience to show a crucial piece of evidence to us. Both these moments work well within the narrative and don’t interrupt the audience’s experience too drastically, but both also give off a distinct air of playfulness even in very suspenseful scenes. They’re such quintessentially Hitchcockian gestures, even down to the symmetry of both moments featuring hands reaching out to the viewer—though they’re very different hands reaching for very different reasons. Though this was to be Hitchcock’s only 3D feature, it seems that even with an enormous stereoscopic camera to contend with, he still managed to enjoy himself making it. 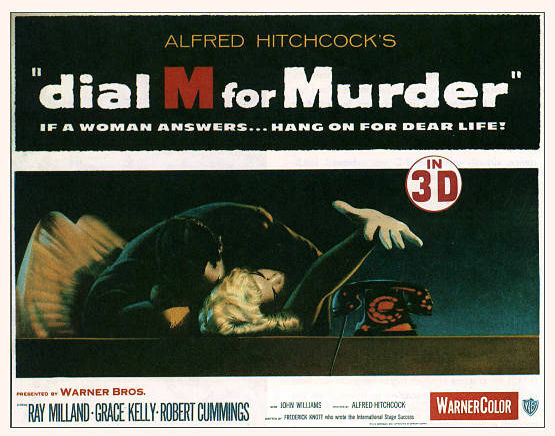 Dial M is a rich film for Hitchcock aficionados, and a fascinating experience when viewed in 3D. Warner Bros. is releasing a 3D blu ray on October 9th, along with a (2D) blu ray of Strangers on a Train (1951). What with all the hysteria over the rise of the DCP and the decline of 35mm projection, this is one restoration that we can all be thankful for. 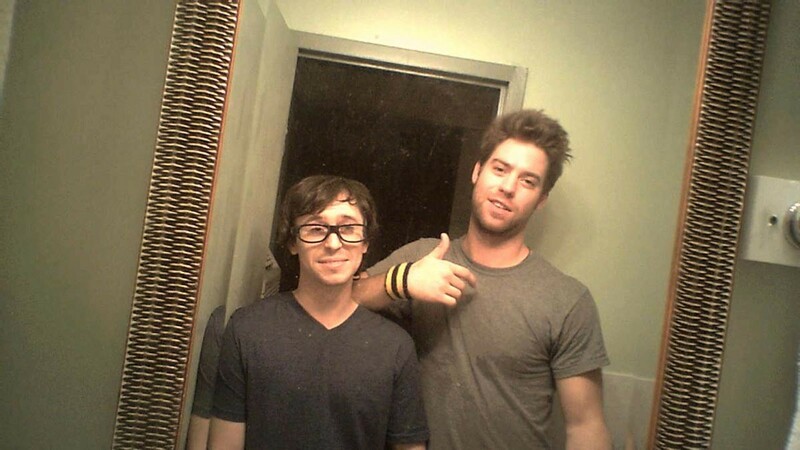 Bring on the goofy glasses!